You can’t just randomly choose the knife you expect to depend upon in cases of emergencies or survival situations. You need to find the best survival knife for you. It is important to understand the purpose of having a survival knife and to know what you should be looking for when buying one. 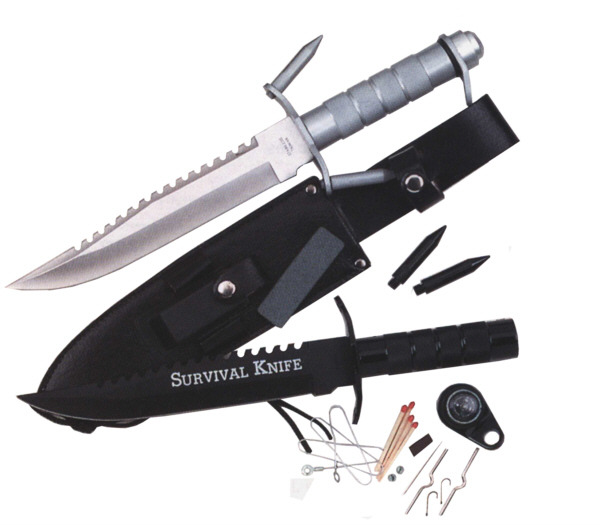 A survival knife is a type of knife that is particularly designed to be used in the wilderness or in environments where typical kitchen knives tend to be less than adequate. It is usually associated with military units, hunters, hikers, and outdoor recreation and sports enthusiasts. A typical survival knife has a relatively thick and heavy blade with a serrated reverse edge. However, there are also those designed to be compact enough to easily fit into a survival kit. Some survival knives also have hollow handles to contain other important items such as matches. Survival knives may have come to greater popularity as one of the most easily identifiable accessories of “John Rambo” but these knives have been in existence earlier than the 19th century. These knives look different from ordinary knives because they feature heavier blades, pommels, and crossguards. They are designed to ensure good grip, durability, and versatile function. Survival knives are made not only to cut things but also to be used as weapons. A survival knife is designed to be durable. Ordinary kitchen knives may not withstand getting used on hard objects. A survival knife can easily resist getting dropped, thrown, or lunged into something tough. Some may say that folding knives are more preferable considering that they are more compact so keeping them in a survival kit is easier. This, however, is a faulty argument. As much as possible, knives to be used for survival cases should not have moving parts to ascertain durability. Foldable knives tend to wear down more easily and are more difficult to handle. Defective moving parts may even lead to accidents. Survival knives are better than bolos. They are more compact. Because of their thick and heavy blade, they can cut into things in ways comparable to what bolos are capable of doing. They can also be used as weapons. Their pommels enable better grip while the crossguards provide protection. The design of survival knives makes it easy to have them attached to the body through specially designed sheaths strapped around the hip or leg. 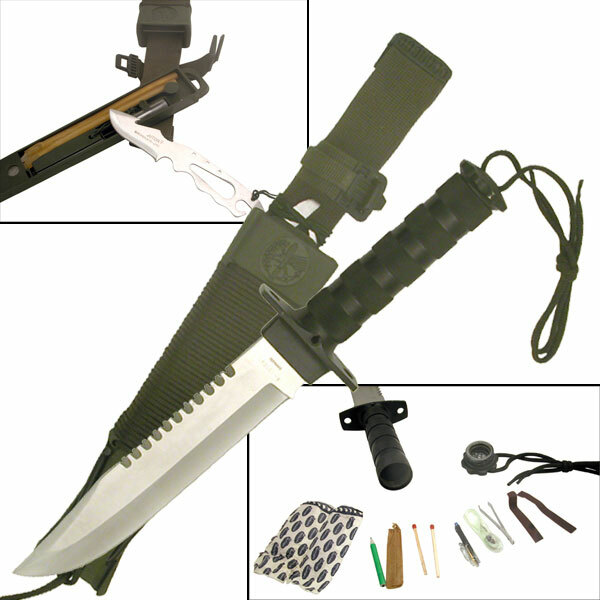 Survival knives are small enough to be inconspicuously and comfortably carried around. Survival knives are designed to be versatile. The can be used for slicing and cutting, food preparation, splitting wood or other similar materials, digging, shelter construction, hunting, prying, and self-defense. These knives can also act as screwdrivers. They can even be used as hammers because of their relatively heavy blades. There are five important features to take into account. These are the size, weight, material, tip, blade edge features, and the reliability of the handle, along with the pommel and crossguards. Size refers to the overall dimensions of the knife. For a survival knife, it is important to have a size that is just enough. It should be big enough to be comfortably used in chopping and splitting things, digging, and slicing. However, it should not be too big so it can be used in more detailed tasks like preparing food. Weight also matters when it comes to survival knives. They should not be too heavy but also not too light to be easily portable and maneuverable. A knife that is too light cannot be usable in chopping or splitting wood. On the other hand, if it is too heavy, it may not be easy to use when dealing with delicate tasks like first aid preparation. The material used to create the knife is important. Steel alloys are regarded as the best materials for knife blades. Two such alloys are popularly used: stainless steel and carbon steel. Both are highly durable but they come with their respective advantages and disadvantages. Generally, carbon steel offers the main advantage of being relatively easy to sharpen. Its disadvantage, though, is that it is more prone to corrosion or rusting. The opposite is true when it comes to stainless steel. Knives made with stainless steel don’t rust easily but sharpening them again may not be so easy. The tips of survival knives, on the other hand, reflect their versatility. They should be sharply pointed to make the knives usable for various purposes such as self-defense, hunting, and elaborate tasks. Obviously, for self defense purposes, knives perform better when used to stab an assailer instead of being used like a sword to slice or cut through the skin of an attacker. Knives with pointed tips, likewise, are more preferable for hunting. Moreover, the pointed tips can be used to work on small but elaborate tasks like removing screws or cleaning game carcasses to prepare food. When it comes to the blades, survival knives preferably should have fixed blades. Foldable knives may offer the convenience of becoming compact but they are likely to be less durable. The folding joints will quickly wear out especially if the knife is used often. Fixed blades are preferable and they should be in a “full tang” setup. This means that the fixed blade should be continuously connected to the handle. As much as possible, the blade and the most part of the handle should be made of the same metal. On the other hand, the blade should not be double-edged. The other edge can be serrated or just plainly blunt. Double-edged knives are dangerous to handle especially because most knife users are accustomed to using kitchen knives that only have one sharp edge. Lastly, the reliability of the handle as well as the pommel and crossguards should be considered. Excellent grip is one of the qualities that make a good survival knife—the reason for having pommels and crossguards. These parts should not be easy to remove. They should be strong enough to be used for occasional light pounding and hammering. They should be strongly attached to the handle. Dropping the knife should not make them crack or break apart. In choosing the right survival knife you need to take into account the features mentioned earlier: size, weight, material, tip, blade, and handle. Many of the quality survival knives available on the market are good enough but choosing one is still a matter of preference. A knife can be too big for someone with small hands so it is important to do personal examination or evaluation before choosing any. The right knife to choose does not have to have a specific weight, size, or material. However, the following features should not be compromised: pointed tip, firmly-connected blade and handle, and solidly-attached pommel and crossguards. As long as these features exist, you can choose a knife with the weight, size, or material you find comfortable. You may even choose a double-edged knife if you are accustomed to using one. It is important to get properly acquainted with the survival knife you intend to buy. The recommended length for these knives is from 6 inches to one foot. However, you may find something bigger (or smaller) more comfortable to use. Just be sure to try using the knife and see if you can properly do chopping, slicing, cutting, and other basic actions you would expect to do with a survival knife. Understandably, most stores will not allow you to actually chop wood or do other similar actions to test the knife you want to buy. Just try to feel the knife in your hand and assess the ergonomics or comfortableness of using it. Blade thickness is suggested to be around 0.1875″ to 0.25″. A survival knife should not easily flex or bend but it must not be too thick that it can hardly be used in slicing meat or cutting delicate materials. Likewise, you can choose a knife that is serrated or one that has a completely straight blade. It’s a matter of preference but most users would recommend choosing a knife that has a serrated part near the handle or one that has one edge that is straight and another that is serrated. A serrated edge has the slight disadvantage of requiring a special sharpener but it can be useful in certain cases. Survival knives are designed to be versatile so there are many ways of using them. For one, they can be used to prepare food in the same kitchen knives are used. Some survival knives have a serrated part that can be used for removing fish scales. They can also be used to chop or split wood to be used for fuel or for building a temporary shelter. Additionally, survival knives can be used as digging tools. Their size and design may not compare to spades and shovels but they are useful enough for digging. 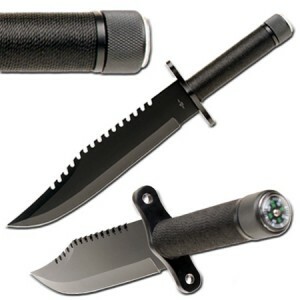 The pointed tip of survival knives, moreover, can be used to do gear adjustments, particularly in removing and reattaching screws as well as in peeling wires that need to be connected. These specially designed knives can also be used as the tip of a spear. They are excellent tools for hunting as well as for cleaning the captured game. Similar to using other tools, there are precautions or safety measures to bear in mind. One of these is to keep the knife properly positioned when carrying it around. Don’t playfully dangle your knife or carelessly carry it by the blade while walking around. Also, avoid playing “Rambo” by throwing your survival knife to a target. You may accidentally hurt others or you may lose the knife you supposedly need for survival. It is also worth considering getting a proper knife sheath so you can safely wear your knife while moving around. Lastly, it is very important to keep your knife sharp and clean. A blunt knife is inefficient and frustrating. You can’t make good use of a knife that barely cuts through meat or greens as you prepare food. While getting a survival knife is not immediately necessary, buying one is worth considering. However, you have to carefully choose the knife you are getting. It should have the versatility of a reliable survival knife. If you think the points mentioned here are not clear enough, visit an established knife shop to ask for more advice in choosing the right knife for you. You can also ask for the insights of experts who are involved in groups for knife enthusiasts, “preppers,” or outdoor recreation and sports.